This book analyzes Islam as a form of 'travelling theory' in the context of contemporary global transformations such as diasporic communities, transnational social movements, global cities and information technologies. 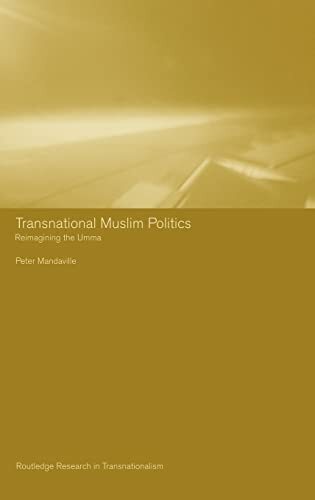 Peter Mandaville examines how 'globalization' is manifested as lived experience through a discussion of debates over the meaning of Muslim identity, political community and the emergence of a 'critical Islam'. This radical book argues that translocal forces are leading the emergence of a wider Muslim public sphere. Now available in paperback, it contains a new preface setting the debates in the context of September 11th. Peter Mandaville is Assistant Professor of Government and Politics at George Mason University in Fairfax, Virginia. He was formerly Lecturer in International Relations at the University of Kent at Canterbury in the UK, and has also held a visiting appointment at the American University in Washington DC. Previous publications include two co-edited books, The Zen of International Relations and Meaning and International Relations.